Antoine Maartens has uploaded a few videos of Tammy Norie taken by his brother Michel. 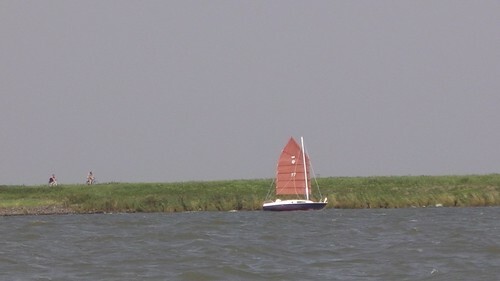 Sailing past Dulcibella on the way from Huizen to Kinselmeer. 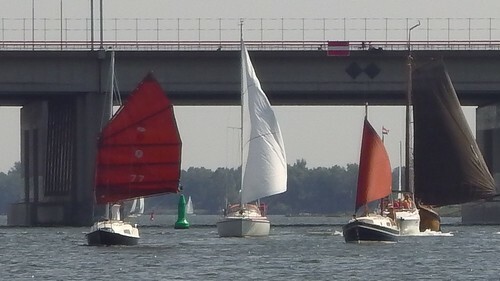 Sailing in to Kinselmeer to meet Siskin and Dulcibella, with commentary in Dutch by Michel. 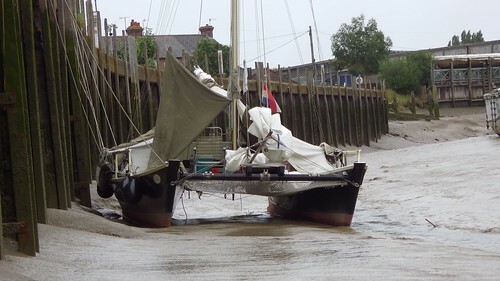 Shows me coming alongside under sail, and how easy it is to do with the junk rig. You can also see some videos of Tammy’s sister Siskin over on Antoine’s channel. Thank you Antoine and Michel! I have quite a lot of video from my Netherlands cruise, but not much where I’m talking about the journey or the boat. So I’ve decided to put together some “flavour” videos to frame everything. Here’s the first, with highlights of the outward journey. Music is the excellent Flying Journey by Reasy. More to come. I do have some talking video too and I’ll edit that too. 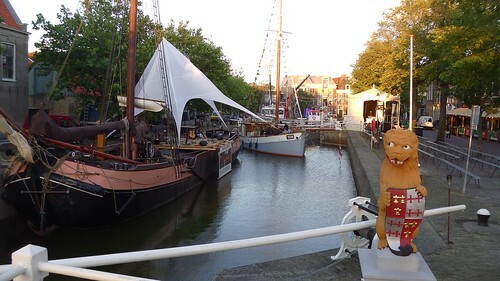 It was the chance to meet Siskin and her owner, Antoine, that made me even think of going to the Netherlands this year. I ended up meeting and making many friends, but sailing Tammy Norie and Siskin together was the biggest goal. We had two great days sailing and a lot of fun. 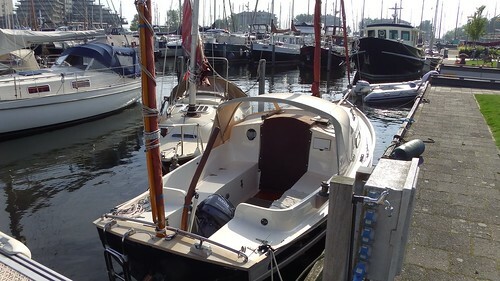 I sailed into Huizen in the afternoon of 2015-08-22 and moored up next to Dulcibella, an immaculate Drascome belonging to Antoine’s brother, Marcel. And then it was over to the next pontoon to take a look at Siskin. 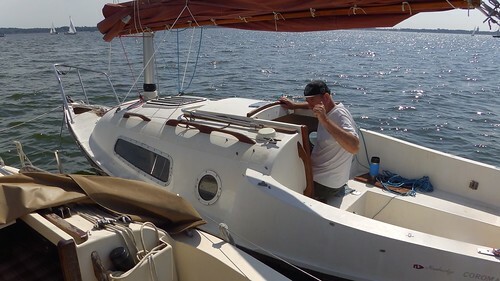 At that point her sail was off, and none of her halyard, sheet, topping lifts, or even mast lift were rigged. We soon sorted that out! 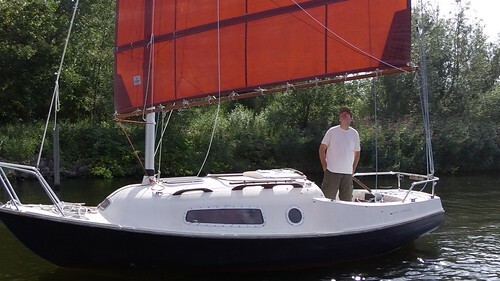 Antoine has modified his mast in a way that’s quite similar to Tammy Norie’s, and so it was quick work to fold it down and get all the lines in place. We had a lovely feast of mussels with Antoine and Marcel and their spouses, and a lot of boat chat. It was really great to meet them all. 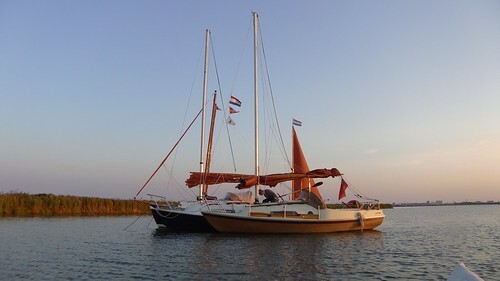 Late in the morning, after a few more fixes, Antoine and I sailed our boats out of Huizen. Antoine at the controls for the first time. How proud and happy he was. We rafted up for some lunch, and soon after we were joined by Marcel on Dulcibella. We spent the evening in Kinselmeer, just east of Amsterdam, and caught the fireworks from SAIL Amsterdam 2015. And we were joined by a swimmer from a nearby Etap. I went to visit them and they showed me how the boat had foam-filled compartments to make it unsinkable. In the morning there was a strong wind from the east, and Antoine didn’t seem sure that we could sail out of the narrow exit to the Kinselmeer. I was sure I could do it, and soon enough he found out that flat sailed junk rigs certainly can go to windward! 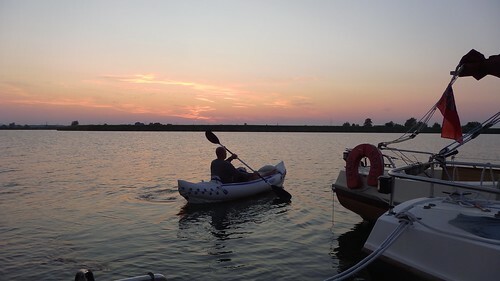 The Markermeer was rough with steep short waves, as I’d been warned, and I was soaked with warm water several times as we reached north to Edam. It was an excellent day. And here’s video of Tammy and Siskin together. 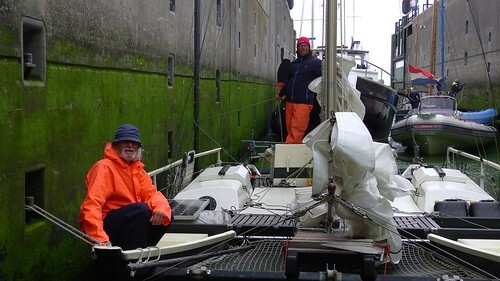 I met Marco and Jan aboard Marco’s Wharram catamaran Stern when I was windbound in Rye at the start of my Netherlands cruise. They were waiting for the same wind change as me, and we had several long chats and meals together. Macro had bought Stern in Scotland and extensively rebuilt and improved her. 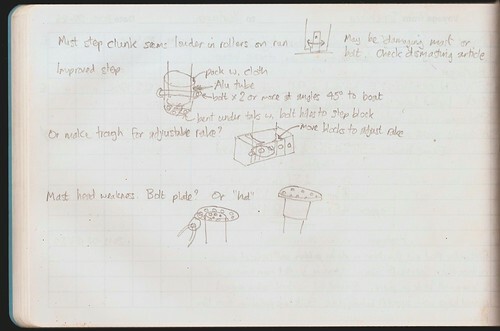 Like Tammy Norie, she was a boat in the DIY spirit, and Marco had a lot of knowledge in common with me. What’s more, he too had a newly fitted self steering system — a Mr. Vane — and was just getting to know it. Jan was an older chap with a friendly twinkle, and though we weren’t able to talk as fluently, he clearly had a great deal of knowledge and experience. They gave me many tips for the Netherlands. Neither Stern nor Tammy are particularly easy to handle through locks, and at one point we missed two cycles as numerous big white cruisers zoomed past us and filled them up. We ended up sailing together to the Netherlands, through Zeeland, up to Amsterdam and through SAIL Amsterdam 2015, finally saying goodbye in the Markermeer as Stern headed home towards Oostmahorn. Our journey through Zeeland was not very pleasant, with rain and headwinds a lot of the time. 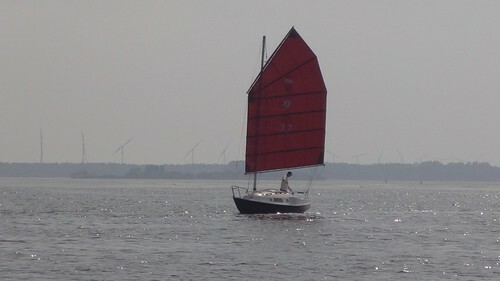 But after we came through the Krammersluis into the Krammer we had a couple of hours of downwind fun, and filmed each other sailing. Here’s some video. Thank you Marco and Jan, for excellent company and new friendships. 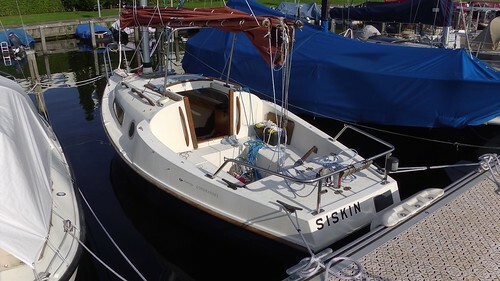 Addendum: It turns out that this boat that I saw in Harlingen, the Bruinvisch, is owned by Jan and his brother. Jan did tell me he had a boat there, but I didn’t know which. Here’s the GPS track for my Netherlands cruise shown on a Google map. The data isn’t complete. 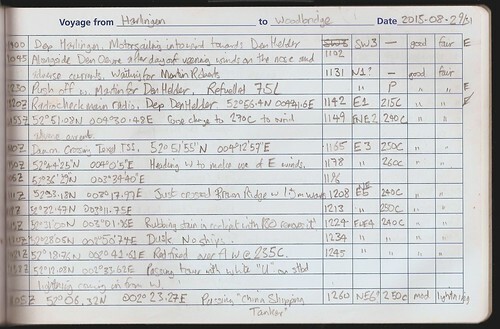 I failed to record from Tershelling to Harlingen. My iPhone also got low half-way across the North Sea and refused to be charged. (The connector had corroded. Timpson fixed it for £25.) I might get around to filling in the rest from the log, but for now here’s a map for you to browse. After a stormy day’s sailing from Terschelling to Harlingen the sky’s twisting clouds opened up into sunlight. 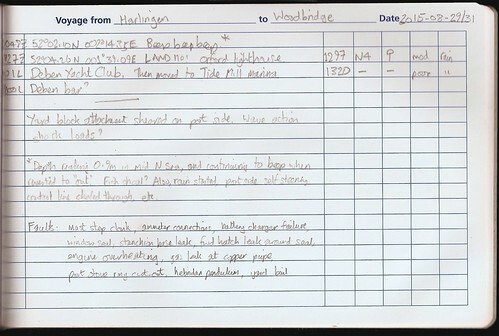 Martin Roberts, my crew for the passage back from the Netherlands across the North Sea, asked for a copy of the log pages from the journey. I thought you all might be interested in seeing them. 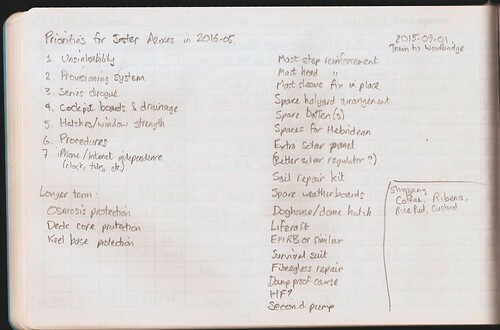 They’re fairly typical of my log book.